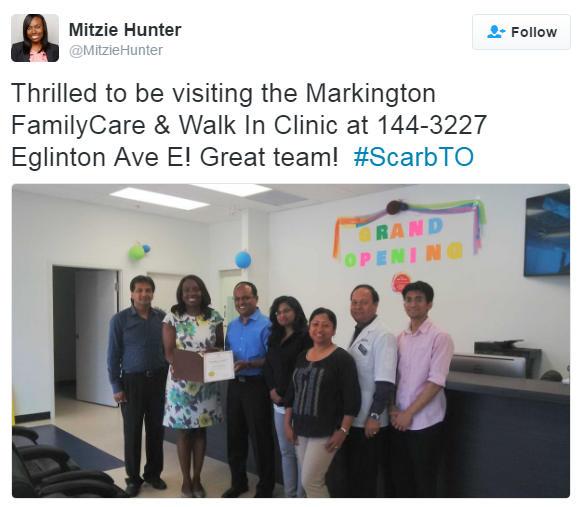 Mitzie Hunter MPP and Ontario’s Minister of education posted the above tweet. Sincerely thankful to her for visiting and presenting us with a Certificate of Appreciation for our service and commitment to promote health care in the community. She promised all possible help and also provided useful tips in promoting our services. We appreciate the support. A modern health care facility operating in the corner of Kingston Road, Eglinton Avenue East and Markham Road. We are dedicated to provide best possible health care to your family. A flu vaccine is needed every season. Take your flu shot in this clinic. From Custom Orthotics, to Medical Grade Compression Therapy - biomechanical assessment, and utilization of the latest technology in 3D scanning and measurement. Take ENG Test to provide your physician information about the source of your dizziness or unsteadiness. Please contact us for appointment.